About two weeks ago, my wife and I made a trek to Scottsdale, Arizona for a mini-vacation to celebrate our five years of marriage. The week we were there was unbelievably hot, with one day clocking in at a cool 118°F (What else would you expect for Arizona mid-summer?). Due to the hot temperatures, I was driven to air conditioned cigar lounges the majority of the days. Oh, darn! I made my way to Fox Cigar Bar in Gilbert, Arizona the first day of our vacation to escape the heat. The selection is outstanding with tons of new cigars and the staff is top-notch. 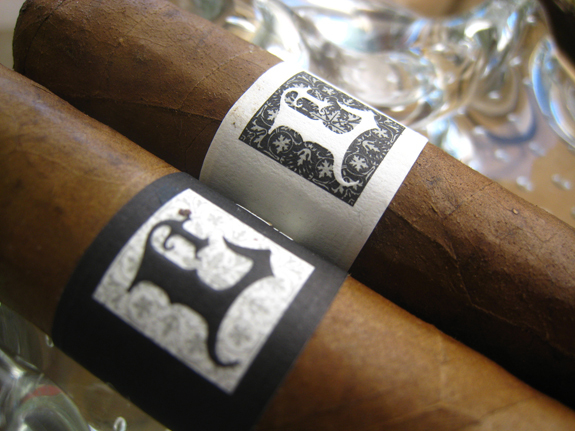 After getting a little crazy in the humidor, I managed to sneak away with a couple of Sam Leccia’s new cigars under his Black and White brand. 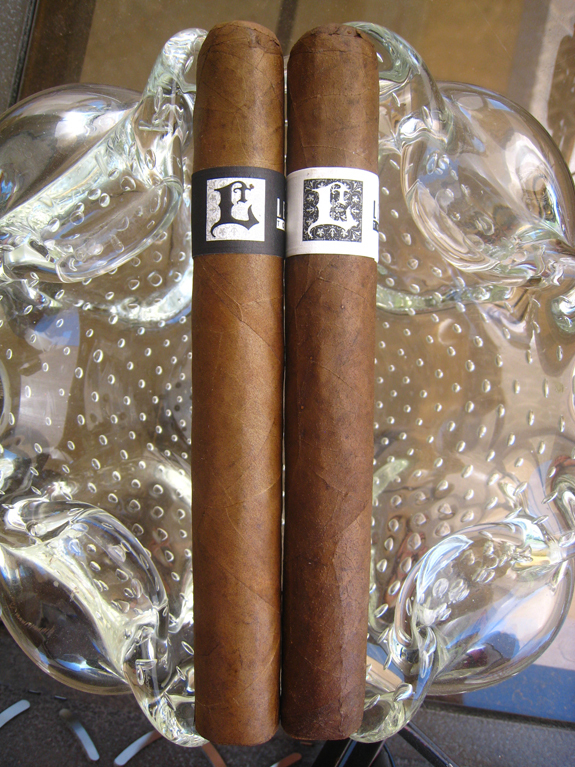 Leccia Tobacco currently has two cigars under its belt, the Black and the White. Well, that makes it easy to remember. The Black is produced in the Dominican Republic at an undisclosed factory and distributed by Torano Family Cigar Co.. According to Halfwheel.com, the Black began shipping at the end of May. Black and White are available in four sizes including: 4 by 46, 5 by 52, 6 by 50, and 6 by 60. Today, I will be reviewing the 6 by 50. 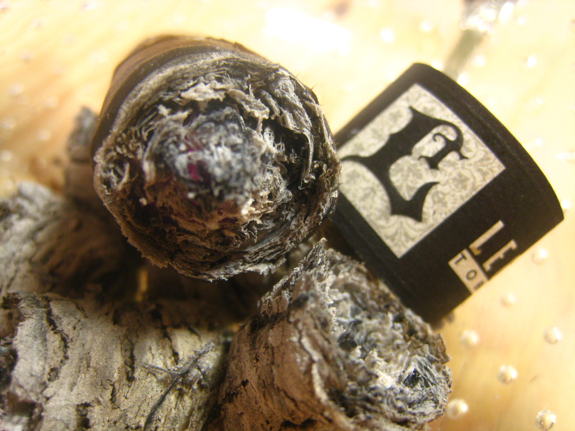 * Dark Fire is a wood fire cured tobacco. The process of fire curing is more commonly used with pipe tobaccos. 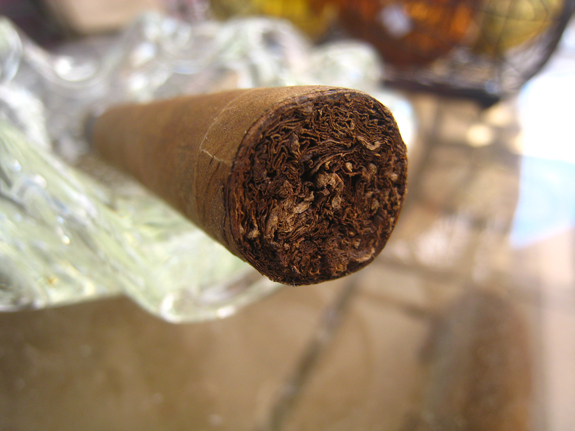 Most cigar tobaccos are air cured. Since you can see the design of the band in the pictures, I will not waste too much of your time describing it. However, I do want to mention that I absolutely love the simple band design. The back side of the band makes it clear which cigar you are smoking with the word “black” easily readable on this one. The Black wears a medium brown wrapper that has a greenish hue. 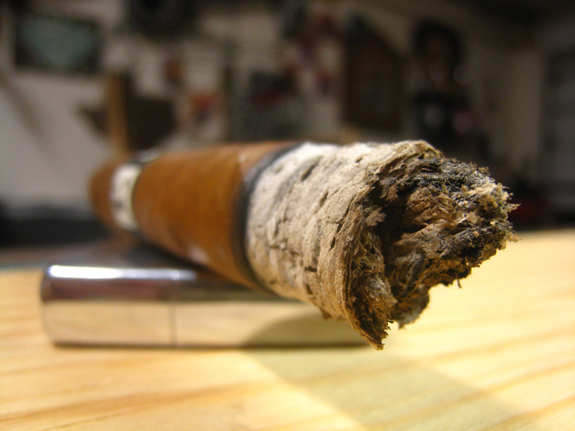 The wrapper is smooth to the touch, has a decent amount of oils, and veins are crisscrossing down the entire stick. I encounter no soft spots as I examine the construction. The aroma off the wrapper is of sweet hickory that is very appealing. The fully packed foot gives off an aroma identical to pipe tobaccos I have come across, but don’t ask me which ones because my knowledge is very limited. The closest thing other than pipe tobacco that I can associate it with is a peaty scotch whisky. The double cap, from what I can tell, has been applied sloppily and a small crack is right in the center of it. Since I will be clipping that part of the cap, it shouldn’t be of any issue. With a quick clip, a firmly packed head is revealed. I really hope this doesn’t have a snug draw. There is some resistance but not uncomfortable. The flavors on the cold draw are unbelievable. The pipe tobacco-like flavors are right at the forefront, a spice warms my mouth, and rich tobacco notes linger on the palate. After spending a good amount of time lighting up the Leccia Black, I am off to the races. Not knowing what to expect after the cold draw, I am pleasantly surprised with the balance and meshing of flavors. A rich mixture of woodsy notes, pepper, and spice awaken my palate. The retrohale on this stick is fantastic, packing a peppery punch. 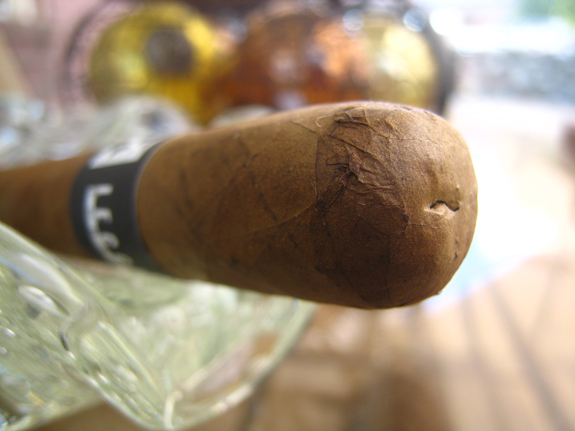 The peaty, pipe tobacco flavors linger on the finish of the smoke like crazy. 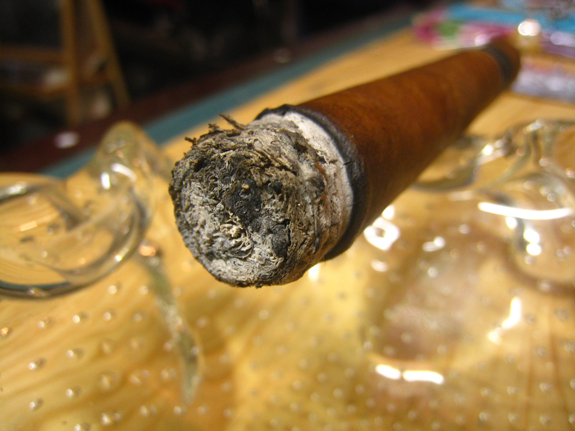 The ash is holding strong past an inch, but to avoid any accidents, I knocked it off into the ashtray. The burn line is thick with a minor wave leaving behind a light grey ash. Flavors are full and strength is a solid medium. After about forty minutes of smoking I am entering the second third. This may be a two hour stick. The peaty flavor hits my palate as soon as the smoke enters my mouth but quickly blends with the flavors picked up on in the first third. Additional, the richness of the flavors has moved up a notch. The pepper has leveled off on the retrohale allowing cedar notes to peek through. The draw still has more resistance than I prefer but a decent amount of white smoke fills my mouth with each puff. Since I am having to pull harder than normal, I am being careful not to overheat this Leccia Black. The burn line has thinned out but remains a little edgy. However, no touch-ups have been required to this point. The band was not going to come unglued without destroying it, so with some effort I was able to slide the band off. The flavors remain rather consistent with the first and second third. The only noticeable change is a toastyness that has joined into the profile. The peaty flavor that comes from the “Dark Fire” tobacco is intriguing in the way it presents itself when the smoke first arrives in my mouth and then again on the finish of the smoke, but balances and blends with the other flavors as the smoke moves across my palate. 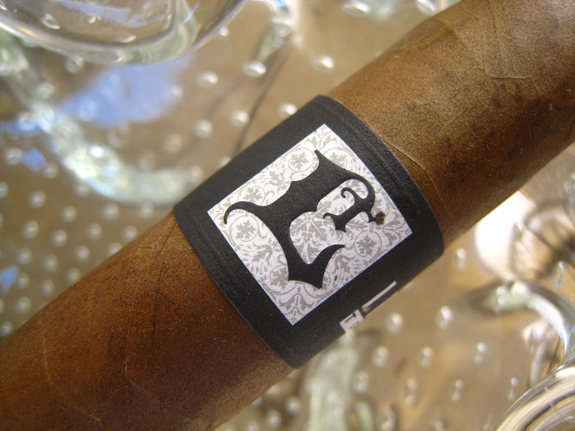 The Leccia Black is delivering a relaxing amount of nicotine that is in the full range, but not overwhelming. The last two inches of burn have been just about perfect. 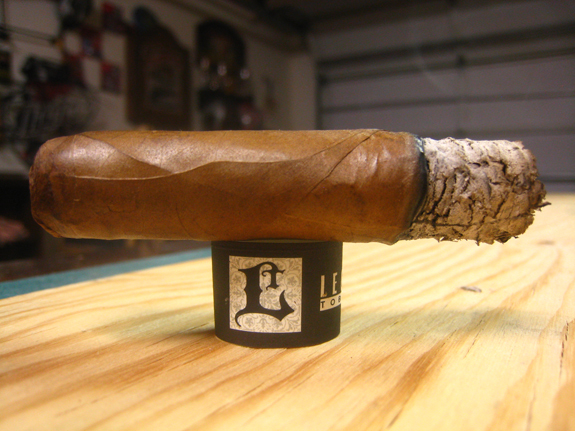 I was overly excited to smoke Sam Leccia’s new cigar. Not because I was a huge fan of the sticks he was behind when he was with Oliva Cigar Co., but because I love trying new cigars. I can hostely say that I was not disappointed in the least. I really enjoyed the Black due to the uniqueness and balance in the flavors and the excellent performance with the burn and ash. While the draw could have been less snug, it was manageable. I think Sam has a winner on his hands with the Black and I am now eager to smoke the White. I would not recommend this to a novice, but someone with a little experience will enjoy this stick or at least appreciate the uniqueness of the cigar. At a price around $8 for the 6 by 50, this cigars falls in the sweet spot and deserves at least a five pack pick-up. Five packs of the Black are available at our site sponsor, Smokeinn.com, for $43.25. Damn, now I’ll have to see about tracking a couple of these down, lol. Sounds like it would go well with an nice Scotch. Everything goes well with a nice Scotch.